You’re probably familiar with the Game Developers Conference by now – Satoru Iwata held a speech there a few days ago (if you haven’t seen it yet, go watch it right now!) – but you might’ve missed this little tidbit of news that came out of another keynote by an important Nintendo figure. Hideki Konno, one of the key minds behind the Mario games as well as the Nintendo 3DS, showed off a tech demo of Mario Kart Wii running in 3D on a special autostereoscopic display not unlike the 3DS’s. He controlled the depth of the 3D effect (a headlining ability in the 3DS) using the Nunchuk, and ran the demo on a standard Wii (not a special souped-up version or anything). The Wii is capable of displaying glassesless 3D content. Nintendo is, at the very least, looking into how they could bring 3D to their home consoles. I’ll stress again that what Konno showed was a simple tech demo, and is by no means a guarantee that we’ll be seeing a 3D Nintendo home console anytime soon. 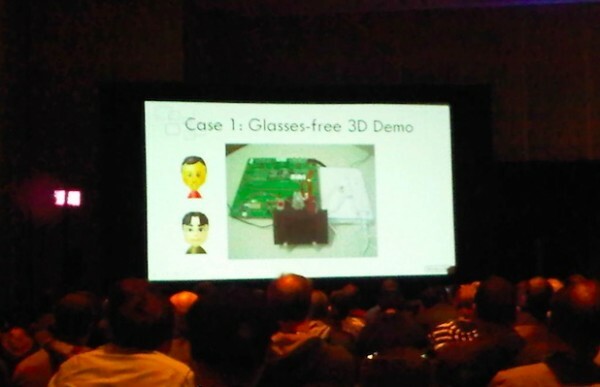 The demo required a proprietary display that could regulate the strength of its 3D effect, and I’m not sure when we’re going to start seeing those, considering current with-glasses 3D TV’s are already having a hard time catching on. Still, with theories that the Wii will still be around for a long time to come, the situation in the market for 3D TV’s may be very different by the time the Wii 2 rolls around. Personally, I’m happy that Nintendo is giving the idea some honest thought, even if we aren’t likely to see it implemented in the (near) future.